Slacker Radio is included as a standard app with the initial release BlackBerry PlayBook’s OS. Just tap its icon from the home screen and set up an account. The basic Slacker account is free; just enter your e-mail address, create a password, and answer a few basic questions to satisfy the advertisers and the legal department. You can use the same account on your PlayBook and on a personal or laptop computer or other device that can access the Internet. Slacker is an interactive music service available in the United States and Canada. You begin with pre-programmed stations or by choosing an artist’s name or title. Once you do that, you can customize (and share) the selection to meet your tastes. 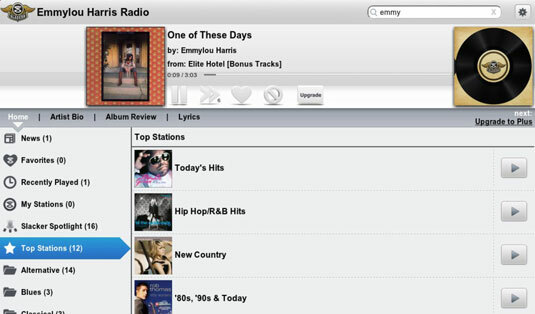 You can pick a station all set to go, based on a particular singer or genre. Pre-programmed stations on Slacker begin with a particular artist or style and then branch off based on decisions made by music aficionados back at the home office. You can also create your own stations, beginning with a particular artist or song and adding the names of artists suggested by the Slacker’s programmers; the system will also branch out from your specific selections. 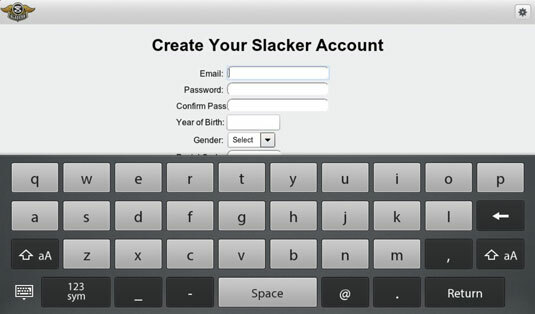 The easiest way to create a personal station is to sign on to Slacker on a personal computer at slacker.com and make your selections there; as long as you use the same sign-in name and password on the PC, the same settings will appear on your BlackBerry PlayBook the next time you load the station from there.